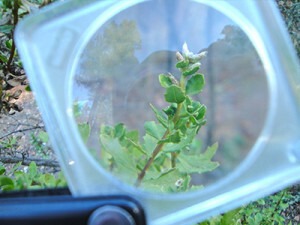 In 2013, Pepperwood became one of the first nine sentinel sites in the state to join the California Phenology Project, a member of the National Phenology Network. Our project joins existing National Park Service sites and UC Reserves in a growing effort to document how the life cycles of plants respond to climate change in California. The Pepperwood Phenology Project is conducted by trained citizen scientists that visit established transects twice a week at the preserve to record the status of individual plants – whether they are in bloom, fruiting, etc. and how cycles change from year to year. We are currently monitoring 11 species of woody shrubs and trees on trails near the Dwight Center for Conservation Science. Click here for a detailed description of plant phenology for the following species. As of January 2017, our citizen scientists have collected over 65,000 records of plant phenology at Pepperwood. Data from this project is available to the public via Nature’s Notebook and the latest publications using National Phenology Network data can be found here. Pepperwood’s citizen scientist and Steward Wendy Herniman showcased her work monitoring oak phenology at the UC California Naturalist conference in Running Springs, CA, September 2016, as well as at the Northern California Botanists conference in Chico, CA, January 2017. View the poster here.